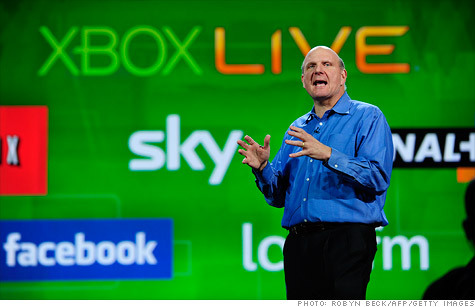 Keynotes from Microsoft CEO Steve Ballmer have kicked off the last three CES shows. But now the company says its product news doesn't align with the show's timing. NEW YORK (CNNMoney) -- One of the tech industry's biggest annual rituals, the January Consumer Electronics Show in Las Vegas, is losing an iconic headliner. Microsoft has decided to pull out of the show, starting next year. For the past three years, Microsoft CEO Steve Ballmer kicked off CES with a keynote speech. It's a role he inherited from Microsoft founder Bill Gates, who gave almost a dozen CES talks over the years. But after CES 2012, Microsoft will no longer give a keynote or have a booth at the Las Vegas show. Microsoft made the announcement Wednesday in a blog post by communications VP Frank Shaw. "Our product news milestones generally don't align with the show's January timing," Shaw wrote in the short post. So Microsoft (MSFT, Fortune 500) began to ask itself: "Are we doing something because it's the right thing to do, or because 'it's the way we've always done it'?" CES representatives did not immediately respond to a request for comment. But it's clearly a blow for the trade show, which depends on big-name attendees to stay relevant. Organizers of the Comdex conference, a computer expo that began in 1979 in Las Vegas, learned that the hard way. It was once a must-go event for techies, but interest began to wane in 1999, and the show was shuttered after 2003. Since then, things have gotten tougher for big trade shows. Companies like Apple (AAPL, Fortune 500) -- which hasn't formally participated in CES for years -- hold their own conferences and product-launch events. Microsoft also hosts its own gatherings, and increasingly relies on communications channels like webcasts, social media, retail stores and other outlets to spread its message. At 2011's CES conference, Ballmer talked mainly about the company's big holiday hit: its Kinect motion-sensor gaming platform. He also touched on Windows Phone 7 and a new, tablet-optimized version of Windows under development -- though the word "tablet" was never spoken. Ballmer learned the hard way to avoid that dreaded word. In his 2010 CES keynote, he waved around a tablet prototype that never made it to market. Who will win in IT in 2012? What would a Bill Gates comeback look like?